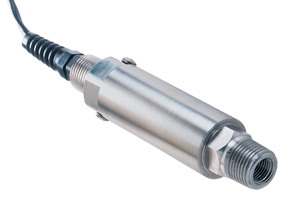 OMEGA’s PXM41 Series are high accuracy, low cost pressure transmitters. Their all stainless steel construction makes them suitable for the harshest environments. They are available in Gauge, Absolute or Sealed Gauge models. Three metres of insulated shielded cable is standard. Twist lock style or micro DIN connectors are also available. A wide selection of amplified voltage and current outputs in the PXM41 family makes this a truly versatile family of industrial transducers. The PXM41 is also available in standard/Imperial configurations, with NPT ports, and models from 0-10 to 0-30,000 psi pressure ranges. Please see the PX41 for complete details, or contact our Pressure department for more information..
Sensing Element: 4 active arm bridge with hermetically sealed thick film strain gauges. To order Sealed Gauge Pressure models, replace "G" in model number with "S" (no charge). To order Absolute Pressure models replace "G" in model number with "A" (no charge).